Hiiii people! So I've got 11 days into October and realised I hadn't posted my September favourites, nooooooooooo. Better late than never? I think so, therefore here we go. 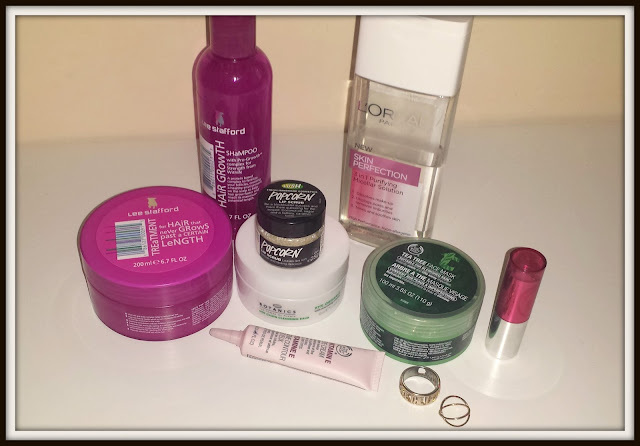 Here's some of the products I've really been loving this month!! Sooo after trying to grow my hair out for well over 2 years and it finally getting past my shoulders, it's suddenly hit a stand still and refuses to go any further. Therefore I have started really putting more time and effort into my locks recently, with more oils, treatments etc to see if I can get it moving again. I found these beauties on a 3 for £12 in Boots which I thought was AWESOME seen as how they are £6 or £7 each!! I bought the Shampoo twice, because I didn't feel I really needed the conditioner as I have so many already and only put it on the ends of the hair anyway. I then bought the hair treatment which goes on after Shampoo but before conditioner. I really like this range, it smells lovely and the treatment especially makes my hair feel silky soft. I think I'm gonna have to do a full review on this as I do think it has helped give my hair a kick up the errrm.. bum! If you haven't got one of these, you really do need one! Blogworld is crazy for them and I now know why! I asked on the #BBloggers chat during the summer about which is the best lip scrub to get, and the Lush Lip Scrubs came up trumps, so the next day I trotted down and picked one of these bad boys up! I went for the popcorn variety as it smells DELISH! It's so easy to apply as well, just scrub a pinch onto your lips and then lick off the excess to reveal silky smooth lips. Literally good enough to eat! I probably use this every other day, as I don't wanna over do it. However, the winter months will probably require every day use. I'm so glad I found this as it makes my lippies and lip balms go on so much nicer! Big thumbs up from mee! I have been using this religiously every night since I bought it mid-september and absolutely love it. It makes my skin feel so clean and soft. See my full review here. I've been using this since I got it as part of a little Birthday present at the end of August and it's still going strong. I use it day and night and really love it. It doesn't sting at all and feels so soothing around the most delicate area of the face. You only need the tiniest amount of this on your ring finger to blend in well, and it doesn't leave a greasy residue - it dries to a matte finish quite quickly which I love. I feel it has really helped with my puffiness and dark circles (which were starting to become regular guests after having my baby - standard, lol). I recommend this, and will most probably buy it again when it runs out! Can't do without an eye cream in my routine now! After being VERY VERY slow in jumping on the Micellar Water bandwagon, I finally thought I'd give it a go when I seen this beauty flying around the blogosphere. Being dubbed a dupe for the famous Bioderma, but for a fraction of the price, I thought I couldn't go wrong with this one. I'm glad I did. I've been loving it so far. It removes ALL traces of makeup like a dream and makes my skin feel so fresh. I have been pairing it with my Boots Botanics Eye Makeup Remover (which I reviewed here) to remove all traces of makeup, before I go on to do a full cleanse. Although I'll have to be honest, I've had a couple of late nights in which I was feeling SO tired that I just lazily used this and nothing else and it worked well. I'll definitely be buying this again when I run out. With this, I don't feel a massive urge to go and buy Bioderma! Another Birthday present which I have been absolutely LOVING. I use this every Sunday night, lol - yes I know it sounds geeky but I like to have a set day so that I don't forget, plus Sunday is usually the night I spend longer in the bath and have a nice long soak. I've really been loving this face mask as it doesn't go rock hard and hurt like some do. It feels so cooling and really feels as though it's cleaning my skin. I've noticed much healthier skin and less redness around my nose since using this and I will continue to do so every week. Full review coming soon! If you read my post in August (here) about how I was lucky enough to win the full collection of The Body Shop's brand new Colour Crush Lip Sticks, you'll know how excited I was. After testing them I have a few favourites, but this one has been featuring heavily recently. It's the most beautiful shade of corally pink and it adds a lovely, but subtle colour to my lips. Perfect for every day use. Very impressed. I've been loving these lately. Finger tops (or above the knuckle rings) are really on trend recently so had to get my hands on one. I bought a thumb ring, and 2 sets of finger top rings and I've been alternating them all month. Beauties! Find them here. What's on your favourites list for September?